2 1-Year / 2-Year (Foundation / Regular) Classroom Courses Available For NDA Preparation. 3 1 Month / 2 Months / 3 Months NDA Exam CRASH COURSE Coaching Is Provided. 4 Daily 7 to 9 hours Classes for the Students Wants to Apply or Applied for NDA Exam. 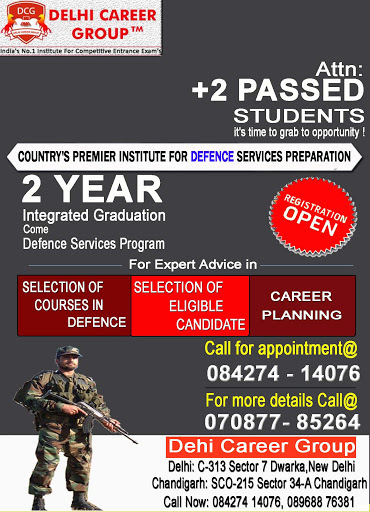 5 Special NDA Targeted Dropper Batches For 12th Pass Out Candidates. 6 Hostel & PG Facility – Available for Students those are from the Other States. 7 Specially Designed +16 Booklets Set For NDA Written Exam are Provided to the Cadets. 8 Best Teachers Available for NDA Subjects like Math, English, G.K, Chemistry, Physics & Others. 9 Optional Green Card Facility For Candidates those wants to free Re-Join for NDA Batches Again. 10 Solid & Compulsory Revision of Previous NDA Ten Year Paper provided to Every Student. National Defence and security is of prime importance for any Government or nation. Defence sector plays pivot role to protect the nation from outside threats on border areas like wars. So the government provides various opportunities and other benefits for the military officers. Candidates join the defence have huge scope for growth.Broadly speaking, defence falls into three categories: Land Defence, Naval Defence and Aerial Defence which are executed respectively by the Army, the Navy and the Air Force. Delhi career Group is a brand name in itself. DCG is well known for providing best Defence coaching for the various competitive exams. Our group is delivering results with unbeatable records for Defence Coaching in Delhi. The Particular caliber of skill and talent followed by Delhi Career Group ensure that every Cadet who join us for coaching, feels fully confident, satisfied and properly prepared for the exam. Special Defence course for 10th class students. Highly Dedicated, Experienced & Permanent Team of Faculty For Each Subject. 6 Months / 3 Months & 45-Days Revision & 1 year and special Crash Courses For Student After +2 Class. Group discussion is also done to enhance the confidence of the students. Intensive Practice Sessions and doubt classes By Expert faculty On Mock Test Of exam pattern.